To display your bank details on your documents, click Settings > Company > Bank account details. Here you can enter your bank details and add as much accounts as needed. Enter a label that allows you to easily identify the account. 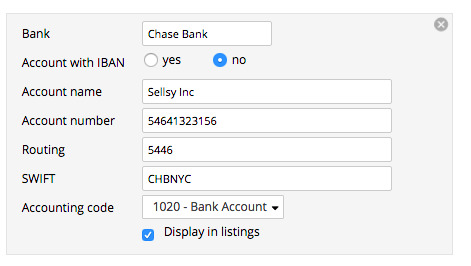 You can choose between traditional account display or the IBAN format, depending on your location. You can also choose the accounting code for your bank transactions. When you later create a document, you can choose the account that you want to display in the list. The account information will appear on your document if you choose bank transfer as payment method.